Owner of the My Farmers Market, Jennifer Bone makes adjustments to the selection of produce on Friday, June 22, 2018, in Groton, Vt. Bone started the market at its current location in October of 2017. (Valley News - August Frank) Copyright Valley News. May not be reprinted or used online without permission. Send requests to permission@vnews.com. Val Kilby, of Chelsea, Vt., browses the local produce at the My Farmers Market, in Groton, Vt., on Friday, June 22, 2018. "It would be hard to not find great food in Vermont," Kilby said, referring to the market as the "future of Vermont." (Valley News - August Frank) Copyright Valley News. May not be reprinted or used online without permission. Send requests to permission@vnews.com. Linda Stoner, of Grafton, N.H., purchases two cartons of strawberries and a quiche at the My Farmers Market on Friday, June 22, 2018, in Groton, Vt. (Valley News - August Frank) Copyright Valley News. May not be reprinted or used online without permission. Send requests to permission@vnews.com. Bags of spices hang at My Farmers Market, a multiple vender market that works with small family farms, local artisans, and stocks local organic foods in Groton, Vt., on Friday, June 22, 2018. (Valley News - August Frank) Copyright Valley News. May not be reprinted or used online without permission. Send requests to permission@vnews.com. Deb LeBarron, of Danville, Vt., looks through the selection of local food and artisan crafts at the My Farmers Market in Groton, Vt., while waiting for her pizza to be ready on Friday, June 22, 2018, in Groton, Vt. "If people don't support it these places aren't gonna make it," LeBarron Said. (Valley News - August Frank) Copyright Valley News. May not be reprinted or used online without permission. Send requests to permission@vnews.com. Jennifer Bone is proud of her farming history. She’s been “digging” dirt for nearly three decades — tilling, planting, pruning and growing vegetables (or produce). Bone has evolved her “ground game” and today shares her passion for agriculture as the founder and owner of MyFarmersMarket, a cooperative vendor-operated farmers market space tucked in Groton, Vt., a rustic corner of the North Country. 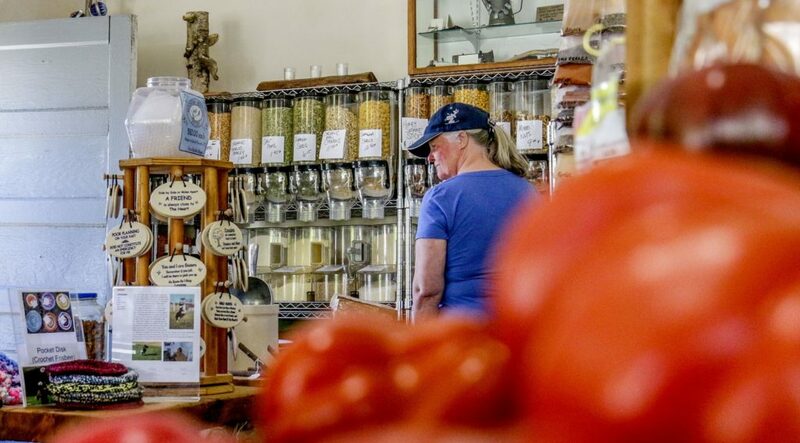 The market’s 1,000-square-foot layout, a former General Store location on Route 302, is where neighbors shop for fresh and local, gather for casual community dining, enjoy music and pop-up dinners and sit and engage as a community. In two short years Bone’s market has become a welcome community space that has encouraged entrepreneurship and supported the local economy. MyFarmersMarket is occupied by more than 20 area small businesses (30-plus in the summer), family farms, local artisans and the wildly popular Jay Duval, known as Mountain Man pizza. It offers a variety of fresh fruits and vegetables, cheeses, breads and meat with businesses and crafters selling jams and jellies, soaps, herbal extracts and dry goods. The Market’s core group of vendors includes Nana’s Kitchen (pies), Rusted Feather Farm (baked goods and eggs), Haverhill’s Schoolhouse Bakery and Cross Molina Farms. The vendors each sell their goods but also are part of a unique business model where Bone requires them to pool their time (each spending three hours a week to manage the register) so she can offer storefront hours six days a week, providing her customers more flexible hours to shop, eat or mingle. And regardless of the weather or the season, Bone, who sources fresh fruits and vegetables year-round, is able to keep MyFarmersMarket open year-round. MyFarmersMarket is part of a national trend that has seen the number of farmers markets in the United States grow rapidly in recent years, from just under 2,000 in 1994 to more than 8,600 markets currently registered in the U.S. Department of Agriculture’s National Farmers Market Directory. According to the USDA, more than 150,000 farmers, ranchers and agricultural entrepreneurs are selling quality products directly to consumers. These direct sales at farmers markets exceeded $1.5 billion nationwide in 2015, the most recent data available. Bone’s children, Noah, 15; Quinn, 12; Genevieve, 7; and Evalyn, 4, all are involved in the farm and the market, and her sons also have branched off to take on more responsibility. Noah, who has been farming for eight years, now tosses pizzas with Duval, and Quinn is displaying his own entrepreneurial spirit and designs: He sells accessories like lanyards, rifle slings and survival bracelets. Prior to MyFarmersMarket, Bone began farming on the New Hampshire seacoast on Barker’s Farm 25 years ago and fell in love with the lifestyle. She moved around a bit, from an herb farm in Epping, N.H., to a couple of farms in Warner, N.H., one a vegetable farm and the other a small diverse family farm. Then she spent time on a dairy farm in South Ryegate, Vt., in 2010 and started her own vegetable, herb and cut-flowers farm. She attended the Groton and Peacham winter and summer markets, where she spent her time managing Groton’s seasonal venues. In doing so, she experienced firsthand the struggles of a small-town market. Still, she was eager to set up a business of her own, and her modest journey began five years ago, out of her garage. She first focused on an online market model. And while that still is part of her offerings today, it quickly became evident that customers wanted to touch and smell their produce. She then graduated to an Amish shed and added a shipping-container-turned-walk-in-sales-cooler. As MyFarmersMarket began to gain attention, Bone started to look to invest in a more expanded property on Route 302 to take things to the next level. Bone made acquaintance with Sally Wilson, who lived in nearby Ryegate, Vt., and has spent her career as ‎a consumer marketing strategist and food and beverage consultant. Wilson, the founder of the Hanover Area Farmers Market and a SCORE counselor, saw something special in Bone’s approach. The two met a few times and discussed possibilities. Wilson encouraged Bone to sign up with Upper Valley SCORE, a nonprofit association dedicated to educating entrepreneurs and helping small businesses start, grow and succeed nationwide. Through the SCORE mentorship, Bone and Wilson have had a wide range of business counseling interactions — from business planning and fundraising to gathering volunteers and spreading the word on her initiative. The interactions continue today. In October, MyFarmersMarket expanded and opened at a new space in Groton. She realized many of her patrons were interested in fresh area produce, and that there were others who wanted to support her but who were unable to visit during the traditional Saturday hours of 10 a.m. to 2 p.m.
What also has made the market’s unique model successful is how community stakeholders (and individual entrepreneurs) have worked diligently and collaboratively. “There’s a tremendous trust factor because we all have a sense of individual and community ownership at the same time. It has really lifted the spirits of many and we have become a pulse of sorts to the Groton community and the North Country region,” Bone said. To establish a startup presence, Wilson played a hands-on role spearheading fundraising dinners. The first was a $100 per plate event; because seating was limited to 36, it quickly sold out. The next event, a casual, buffet-style dinner priced at $30 per plate, took shape soon after and also was a quick sellout. The dinners were led by volunteer efforts. Bone has no shortage of ideas to further evolve MyFarmersMarket’s offerings, from summer events and exploring more regular pop-up dinners with music and vendor samplings to exploring a Groton winter festival and offering some cooking and preserving classes in the next year. She also has eyeballed the space next door and can envision, with a little work and some TLC, hosting a local used sporting gear and flea market. She also has ideas of creating a large root cellar and food distribution center in the basement of the space and is looking to secure nonprofit status. Lynn Luczkowski is a SCORE volunteer and president of L2 Communications, a public relations, marketing communication and social media agency in Quechee. Email her at Lynn@L2comm.biz.